Billings Boats BIL5003 Le-Jylland wood ship kit! The frigate Jylland was the Danish Navy’s last warship built of oak. 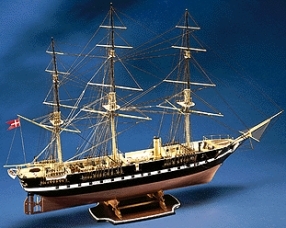 It was launched on 20th January 1860 and was the first steamdriven propeller frigate. The engine yielded 400 HP and gave a top speed of 12 knots. Length 96 m, breadth 13.5 m, tonnage 2,450 tons. Today the Jylland is in dry dock at Ebeltoft in Denmark, and serves as a museum.